Whichever way you cook your beans, be sure to budget the time for the pressure to come up and begin the actual pressure cooking, 10 to 15 minutes, depending on your pressure cooker. So, including the time it takes to come to pressure, you can have tender pinto beans in about 15 minutes. That’s with soaked beans and pressure naturally released. Unsoaked dried beans, the pressure quick-released, yield tender pinto beans in about 35 minutes. The deep-down with pressure cooking beans is you save time and you get superior quality beans. Dried beans—keep them in your pantry. And give your pressure cooker a big hug! 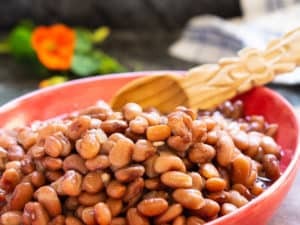 When cooking dried beans do you salt before or after cooking? There’s plenty of discussion about that. I come from the salt-after-cooking school. Salt with good quality salt. Looking for answers, author Michael Ruhlman found more than one food “expert” with differing thoughts about soaking and salting beans. 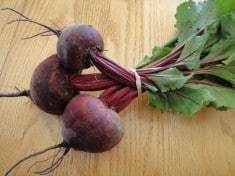 On his blog, Rancho Gordo’s Steve Sando has written more than once about soaking and when to salt. Shop for superior quality fresh dried beans on Rancho Gordo’s website. It has been said that soaking dried beans before cooking makes them more digestible. Mexican cooks add epazote, a pungent green herb with “gas-relieving” properties, to their beans. For the record, we do have an assortment of canned beans in our pantry, right next to the jars of dried beans. For sure canned beans in salty liquid are no match for freshly cooked beans and their resulting liquid, but sometimes you just want to open a can, ya know? Since Robbie and I mostly use pinto beans in tacos and other Mexican foods, I season the dried beans with a mild dried chile, garlic cloves, and maybe some chopped onions. There’s not much written about the beauty of pressure cooked beans. One thing’s for sure, pressure cookers reduce cooking time and fuel energy. For cooking beans, they’re awesome tools! When is a pressure cooker is up to pressure? Pinto beans, not soaked and pressure quick-released, take about 25 minutes to cook, after the cooker comes to pressure. Soaked pinto beans, pressure released naturally, take about 3 minutes to cook. Plan on 10 minutes for the pressure cooker to release naturally. 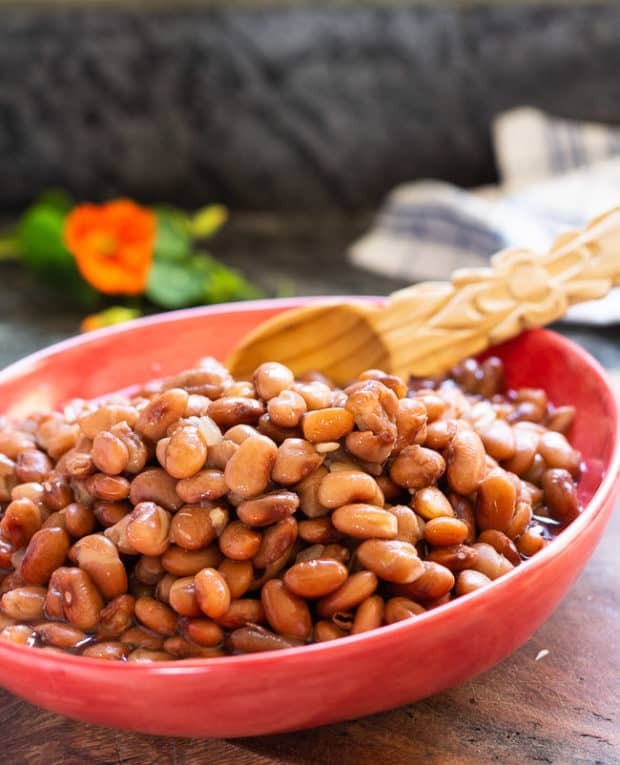 Soaked pinto beans with the pressure “quick released” take 5 to 6 minutes to cook. 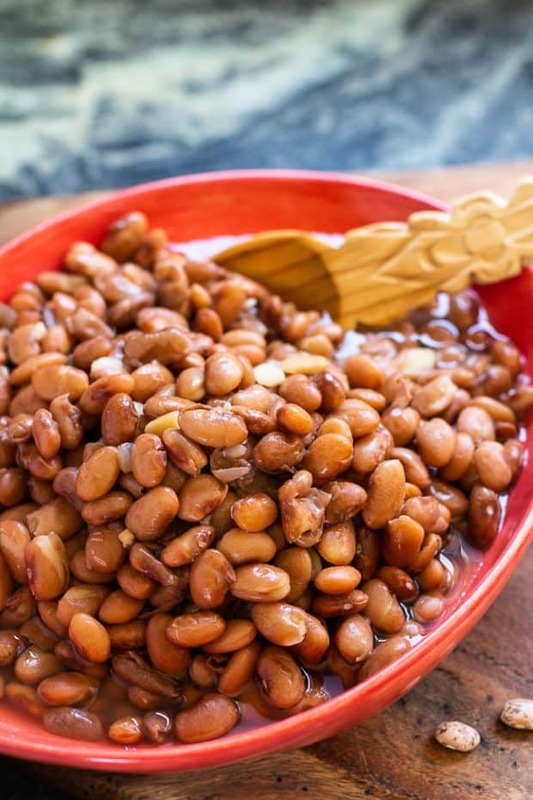 Without a pressure cooker it takes at least 2 ½ hours to cook pinto beans to tenderness. Cooking times can vary a few minutes either way, depending on your pressure cooker, the size of the beans, and the age of the dried beans. Sometimes you have to bring the cooker back up to pressure for another minute or two. With the beans still very hot, it doesn’t take much time. Add 25% more time if pressure cooking at altitudes more than 4000 feet above sea level. My Swiss made Kuhn-Rikon stovetop pressure cooker comes to pressure and quick-releases pressure faster than my Instant Pot electric pressure cooker. I don’t change the cooking time. Smaller dried beans like navy, cannellini, and black beans cook just a little faster. 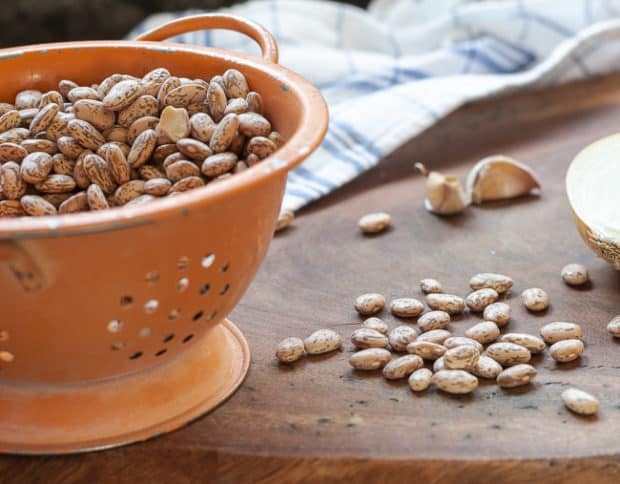 What can you do with your pressure-cooked pinto beans? Mash your beans with sauteed aromatics and pot broth for refried beans, your way. Make potato and bean tacos. Try Greens and Potato Soup with pinto beans and hominy. Use the bean cooking broth as an excellent soup base. Make Spicy Chard and Pinto Bean Risotto—in the pressure cooker too! Bake Taquito Flautas and serve them with a 2-ingredient avocado guacamole. 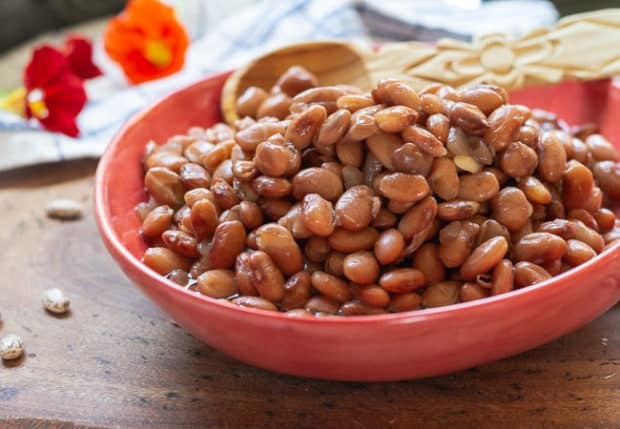 Toss pinto beans into salads. Lightly mash the beans. Put in a flour tortilla with avocado, mixed baby greens, sliced pickles, whatever your sandwich heart desires. Roll into tortilla burritos. Robbie adds cottage cheese and hot sauce to his! 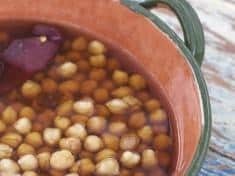 *** Here’s how to cook garbanzo beans in the pressure cooker. 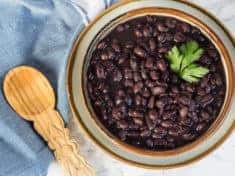 *** You might also find this recipe for cooking black beans in the pressure cooker helpful. Make it a fabulous week–get in the kitchen and play with your pressure cooker! The pressure cooker or Instant Pot is your tool for perfectly tender pinto beans, ready for your next meal. This recipe makes about 4 ½ cups cooked beans and 3 cups delicious broth. (Serving size 1/2 cup.) Time estimate below is for soaked, natural pressure released. Servings: 9 (1/2 cup) servings. Soak or unsoaked, put the rinsed beans into the pressure cooker or Instant Pot. Especially with the Instant Pot, add the olive oil to prevent foaming. If you wish, add onion, garlic, dried chiles, and a spring of fresh parsley, cilantro, or epazote. Cover with hot water—3 inches above the level of the beans. Test a bean to make sure it’s tender to your liking. If the beans need to cook more, bring to pressure again for a minute or so. Quick release. You’re there—perfectly cooked pinto beans for you next recipe. Once the cooker is up to pressure, soaked pinto beans, pressure released naturally, take about 3 minutes to cook. Once the cooker is up to pressure, soaked pinto beans, pressure quick-released, take 4-6 minutes to cook. Once the cooker is up to pressure, beans not soaked and pressure quick-released, take 20 to 25 minutes to cook. To quick release in the Instant Pot, turn the dial from Sealed to Vent. In a regular stovetop pressure cooker, quick-release the pressure by running water over the top. Cooking times can vary a few minutes either way, depending on your pressure cooker, the size of the beans, and the age of the dried beans. If the beans are not quite done, bring the cooker back up to pressure for another minute or two. With the beans still very hot, it doesn’t take much time.